Burgess Hill Town boss Ian Chapman feels that his side’s performances in recent weeks will lead to positive results in the league. Hill host AFC Hornchurch on Saturday in the Bostik Premier Division, searching for their first league victory of the season. 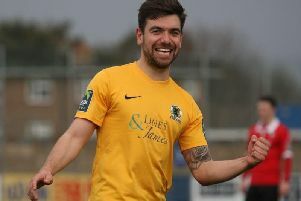 Chapman’s side exited the FA Cup last weekend after a 3-0 away defeat to National League South side Hampton & Richmond Borough but the Hillians manager believes his team are beginning to regain confidence. He said: “I do think that over the last two or three weeks there’s been a shift at the club. I do feel that there’s a confidence coming back. “Despite a 3-0 defeat in the cup, preceding that we have been playing some really good stuff and I do feel that the players are buying in to what we want to do. Chapman also feels that his range of forward options will be key as Hill look to pick up their first three points. As Hill have yet to pick up a win after seven league games, Chapman conceded that the confidence of his players had suffered as a result. Despite this, the Hillians boss has backed his side to live up to their potential and feels that once his side pick up their maiden win they have the potential to go on a good run. Chapman said: “All the time you don’t pick up a league win it affects confidence, that’s just football. It hits you in the face and it’s plain to see and you can’t ignore that. “It’s about us understanding that it’s a 40-odd game season and there are loads of games to play and I do feel that if we get that win under our belt quite quickly I think this side can go and have a good run.